Note: The article below is from the "Pastoral Reflections" column in The Vision, the weekly e-newsletter of Christ Reformed Baptist Church. To receive the complete newsletter weekly, send your request to info.crbc@gmail.com. While it shows forth the Lord’s death, it represents at the same time the spiritual benefits which the believer derives from it. 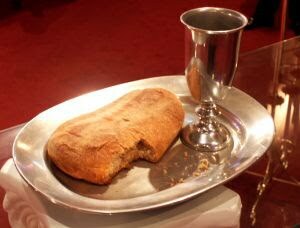 He eats the bread, and drinks the wine, in token of his receiving his spiritual sustenance from Christ crucified. The rite preaches the doctrine that Christ died for our sins, and that we live by his death. He said, “Except ye eat the flesh of the Son of Man, and drink his blood, ye have no life in you” (John 6:53). These remarkable words teach the necessity of his atoning sacrifice, and of faith in that sacrifice. Without these, salvation and eternal life are impossible. When Christ said, “My flesh is meat indeed, and my blood is drink indeed” (John 6:55), he did not refer to his flesh and blood, literally understood. He calls himself the living bread which came down from heaven (John 6:51). This cannot be affirmed of his literal flesh. To have eaten this literally, would not have secured everlasting life; and equally inefficacious is the Romanist ceremony, in which they absurdly imagine that they eat the real body of Christ. His body is present in the eucharist in no sense than that in which we can “discern” it. When he said, “This is my body,” the plain meaning is, “This represents my body.” The eucharist is a picture, so to speak, in which the bread represents the body of Christ suffering for our sins. Faith discerns what the picture represents. It discerns the Lord’s body in the commemorative representation of it, and derives spiritual nourishment from the atoning sacrifice made by his broken body and shed blood. I have leaned heavily on your loving care over the past few years (more so in the last few months!). Your faithful prayers have brought comfort and strength; your cards, emails and calls have lifted my spirits and knowing that you genuinely loved both as your Bill and me as your own brother and sister has given us assurance and stability to continue when at times the path seemed rocky and unpleasant. Be assured that both of us have uttered many praises and prayers for His blessings on each of you. We are thankful for this special “family” God has called us to. I look forward to continuing to grow and serve together.